Internet Account Access with Teller24e allows you to access your accounts using any Internet-enabled computer or tablet 24-hours a day, 7-days a week. Signing up is easy. From the Teller 24e log in screen, click on the link that says: “New Users: To Signup for Teller 24e Click Here.” From there, you’ll find step-by-step instructions. To get started, CLICK HERE. The Taleris Mobile Branch gives you 24/7 access to your accounts from your phone or tablet. There are three different ways to your accounts, giving you access no matter what kind of mobile device you have: a Taleris Mobile App, Taleris Mobile Web, and SMS Text Banking. For complete details, CLICK HERE. For those occasions when you do not have access to a computer and you find your self in a WiFi desert, you can still access account information over the phone. Taleris Audio Account Access provides a means to get to a variety of account information, over the telephone. Inquiries about your balance, checks, withdrawals, loan payments and more is available by selecting “Taleris Audio Account Access” when you dial 216.739.2300 or 800.828.6446. For a listing of service options and instructions, CLICK HERE. With our online bill payment service, you can pay your bills from the comfort of your own personal computer. There is no need to buy stamps, envelopes, or checks—you can pay your bills at the speed of the Internet anytime, from anywhere. Set up Taleris Online Bill Payment individual and recurring bills with the dates and payments you want. You must be signed up for Taleris Teller 24e online account access to be eligible for Bill Pay. It takes minutes to set up and, it is completely free to use. You can enroll in online Bill Pay from Teller 24e by clicking on the Bill Pay tab. To access Teller 24e, CLICK HERE. E-Statements provide electronic access to your monthly account statements. They are accessed online and may be printed at your location. They provide a quick and convenient way to review all your Taleris account activity. 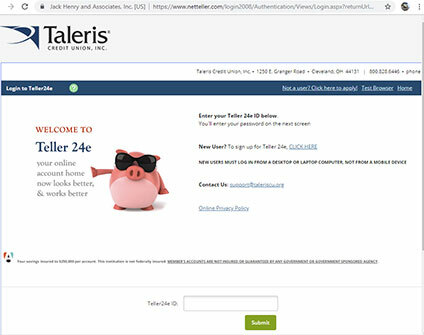 You must be signed up for Taleris Teller 24e online account access to be eligible for e-statements. To receive e-statements, log in to Teller 24e, and click on the E Statements tab in the menu bar, and select e-statements from the drop down menu that appears. 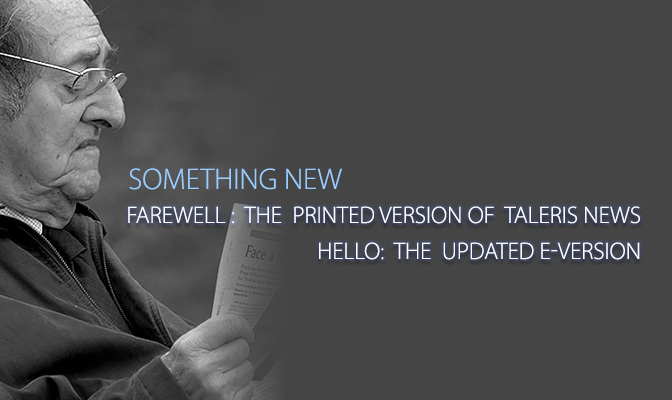 To access Teller 24e, CLICK HERE. Then, just CLICK HERE and follow the instructions. The link will open in a new window and direct you to a site maintained by Harland Clarke. Not a member yet, but wish you were? Fear not. If you’ve got about 10 minutes and an internet connection, you can join online from your phone, tablet or computer. CLICK HERE for details. Members and non-members can apply for a loan online. NOTE: If you are not currently a Taleris member, you must join in order to complete the loan application. For more information, CLICK HERE.